The SoilVUE™10 is a soil water content profile sensor powered by Campbell TrueWave™TDR technology. This soil moisture, electrical conductivity, and temperature profile sensor was developed with environmental researchers and environmental monitoring networks in mind. The SoilVUE™10 represents several exciting advancements in in-situ soil measurement that should make this an extremely compelling option for anyone in these applications who needs to make multiple measurements in a profile. Campbell Scientific’s proprietary TrueWave™TDR technology combines a best-in-class rise time with an advanced waveform analysis technique to determine the true travel time of a high-frequency pulse. This process achieves a high-resolution, smooth signal for measurements that are defensible and can be universally compared with other TDR measurements. Not all TDR-based sensors perform equally well. 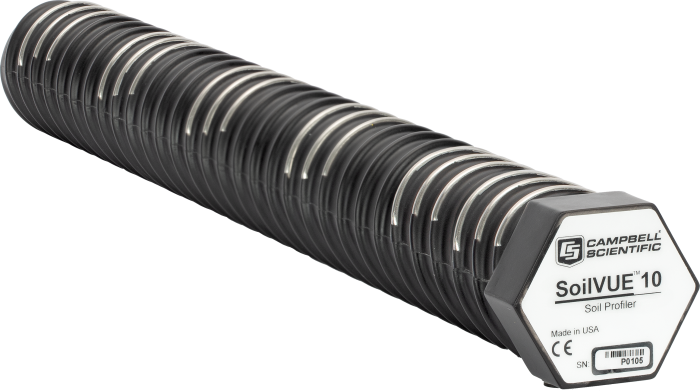 The SoilVUE™10 consists of TDR circuitry connected to a series of six or nine helical wave guides that make up part of the overall threaded design. 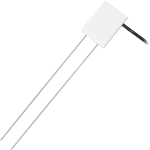 The threaded design with individual sensors built into the threads improves sensor contact with the soil to reduce potential error from air gaps. The TDR circuitry generates a short rise time electromagnetic pulse that is applied to the helical wave guides. The elapsed two-way travel time of the applied pulse is used to calculate the dielectric permittivity of the surrounding media and determine the volumetric water content using a mixing model. 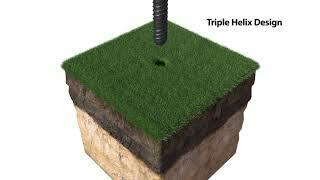 The soil water content profile sensor can be installed in a hole made by a standard 5 cm (2 in.) hand auger. Excavation machinery or expensive custom tools are not necessary to install the sensor. The included cable has an IP67 rated M12 connector that is detachable from the sensor for easy field replacement if the cable becomes damaged. Soils with high organic matter (> 12% soil organic carbon) or high clay content (> 45% clay) may need a soil-specific calibration due to the dispersive nature of these materials.